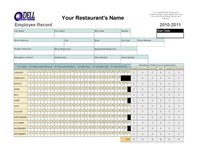 Get a free Employee Record spreadsheet download from O’Dell Restaurant Consulting’s webstore! Until February 29th, 2012, receive a FREE download of O’Dell Restaurant Consulting’s Employee Record Spreadsheet from our webstore! It normally sells for $10! How to get it: Sign up to receive our blog by email, or be an existing member, and email Brandon O’Dell (address below) with O’Dell Restaurant Consulting to be sent a link to download the Employee Record Spreadsheet for free! I will verify your email address against our subscription list and send you a link to download the spreadsheet. Please put Free Employee Record Spreadsheet in the subject line of your email.